James later coined the terms "hard determinism" and "soft determinism" in his essay on "The Dilemma of Determinism," delivered as an address to Harvard Divinity School students in Divinity Hall, on March 13, 1884 at 7:30pm, and published in the Unitarian Review for September 1884. There is a temporal sequence of undetermined alternative possibilities followed by adequately determined choices. James was considering a case where his two choices were essentially equivalent, the so-called "liberty of indifference" (the scholastic liberum arbitrium indifferentiae). He also imagined his actions repeated in exactly the same circumstances, which is regarded today as one of the great challenges to libertarian free will. James very likely had the new (1859) model of Darwinian evolution in mind. Unlike his colleague Charles Sanders Peirce, from whom he learned much about chance, James accepted Darwin's explanation of human evolution. Although Peirce is well-known for his enthusiastic acceptance of chance (he called it "Tychism"), he did not care for Darwin's idea that chance drove the variations. Compare James, who in 1880 suggested a strong similarity between genetic evolution and the evolution of ideas. A remarkable parallel, which I think has never been noticed, obtains between the facts of social evolution on the one hand, and of zoölogical evolution as expounded by Mr. Darwin on the other. Darwin's achievement was to define the true problem with which we have to deal when we study the effects of the visible environment on the animal. That problem is simply this: Is the environment more likely to preserve or to destroy him, on account of this or that peculiarity with which he may be born? James says that Darwin probably thought that his "accidental variations" were produced in accordance with some grand natural law, so that everything, in some remote and round-about way, hangs together. But James was more willing to see accidents and chance in mental evolution. If we look at an animal or a human being, distinguished from the rest of his kind by the possession of some extraordinary peculiarity, good or bad, we shall be able to discriminate between the causes which originally produced the peculiarity in him and the causes that maintained it after it is produced; and we shall see, if the peculiarity be one that he was born with, that these two sets of causes belong to two such irrelevant cycles. It was the triumphant originality of Darwin to see this, and to act accordingly. Separating the causes of production under the title of 'tendencies to spontaneous variation,' and relegating them to physiological cycles which he forthwith agreed to ignore altogether, he confined his attention to the causes of preservation, and under the names of natural selection and sexual selection studied them exclusively as functions of the cycle of the environment. But, in spite of all these facts, I have no hesitation whatever in holding firm to the Darwinian distinction even here. I maintain that the facts in question are all drawn from the lower strata of the mind, so to speak, - from the sphere of its least evolved functions, from the region of intelligence which man possesses in common with the brutes. James sounds much like Lucretius in his descriptions of random images that "come to us." Note that James does not literally mean that the environment selects, but only in the Kantian sense that we put our questions to Nature and nature responds. It is one of the tritest truisms that human intelligences of a simple order are very literal. They are slaves of habit, doing what they have been taught without variation; dry, prosaic, and matter-of-fact in their remarks; devoid of humor, except of the coarse physical kind which rejoices in a practical joke; taking the world for granted; and possessing in their faithfulness and honesty the single gift by which they are sometimes able to warm us into admiration. James is perfectly clear that the human will chooses from among alternative possibilities, which are generated by chance "spontaneous variations"
But even this faithfulness seems to have a sort of inorganic ring, and to remind us more of the immutable properties of a piece of inanimate matter than of the steadfastness of a human will capable of alternative choice. When we descend to the brutes, all these peculiarities are intensified. No reader of Schopenhauer can forget his frequent allusions to the trockener ernst of dogs and horses, nor to their ehrlichkeit. And every noticer of their ways must receive a deep impression of the fatally literal character of the few, simple, and treadmill-like operations of their minds. But turn to the highest order of minds, and what a change! Instead of thoughts of concrete things patiently following one another in a beaten track of habitual suggestion, we have the most abrupt cross-cuts and transitions from one idea to another, the most rarefied abstractions and discriminations, the most unheard-of combinations of elements, the subtlest associations of analogy; in a word, we seem suddenly introduced into a seething caldron of ideas, where everything is fizzling and bobbing about in a state of bewildering activity, where partnerships can be joined or loosened in an instant, treadmill routine is unknown, and the unexpected seems the only law. According to the idiosyncrasy of the individual, the scintillations will have one character or another. They will be sallies of wit and humor; they will be flashes of poetry and eloquence; they will be constructions of dramatic fiction or of mechanical devices, logical or philosophic abstractions, business projects, or scientific hypotheses, with trains of experimental consequences based thereon; they will be musical sounds, or images of plastic beauty or picturesqueness, or visions of moral harmony. But, whatever their differences may be, they will all agree in this, - that their genesis is sudden and, as it were, spontaneous. That is to say, the same premises would not, in the mind of another individual, have engendered just that conclusion; although, when the conclusion is offered to the other individual, he may thoroughly accept and enjoy it, and envy the brilliancy of him to whom it first occurred. 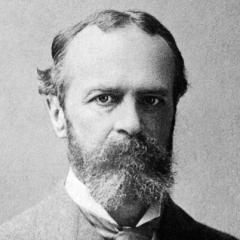 We find that William James was the first of two dozen philosophers and scientists who have proposed a two-stage model for free will and creativity. The first stage involves chance that generates alternative possibilities for action. The second stage is an adequately determined choice by the will. In a dozen essays published between 1905 and 1907, James put forward his thesis of a radical empiricism that would greatly simplify the idea of consciousness, pulling it back from the dualist metaphysical position that the neo-Kantiams and transcendentalists consigned it to. "Thoughts" and "things" have something important in common, and that is our experience of them. The separation of mind and body, spirit and matter, had produced the "transcendental ego," a bare "consciousness" of which nothing can be said. Experience, I believe, ...and the separation of it into consciousness and content comes, not by way of subtraction, but by way of addition — the addition, to a given concrete piece of it, other sets of experiences, in connection with which severally its use or function may be of two different kinds...The dualism connoted by such double-barrelled terms as ‘experience,’ ‘phenomenon,’ ‘datum,’ ‘Vorfindung’ — terms which, in philosophy at any rate, tend more and more to replace the single-barrelled terms of ‘thought’ and ‘thing’ — that dualism, I say, is still preserved in this account, but reinterpreted, so that, instead of being mysterious and elusive, it becomes verifiable and concrete. It is an affair of relations, it falls outside, not inside, the single experience considered, and can always be particularized and defined. If the reader will take his own experiences, he will see what I mean. Let him begin with a perceptual experience, the ‘presentation,’ so called, of a physical object, his actual field of vision, the room he sits in, with the book he is reading as its centre; and let him for the present treat this complex object in the common-sense way as being ‘really’ what it seems to be, namely, a collection of physical things cut out from an environing world of other physical things with which these physical things have actual or potential relations. Now at the same time it is just those self-same things which his mind, as we say, perceives; and the whole philosophy of perception from Democritus’s time downwards has just been one long wrangle over the paradox that what is evidently one reality should be in two places at once, both in outer space and in a person’s mind. ‘Representative’ theories of perception avoid the logical paradox, but on the other hand the violate the reader’s sense of life, which knows no intervening mental image but seems to see the room and the book immediately just as they physically exist. One of them is the reader’s personal biography, the other is the history of the house of which the room is part. The presentation, the experience, the that in short (for until we have decided what it is it must be a mere that) is the last term in a train of sensations, emotions, decisions, movements, classifications, expectations, etc., ending in the present, and the first term in a series of ‘inner’ operations extending into the future, on the reader’s part. On the other hand, the very same that is the terminus ad quem of a lot of previous physical operations, carpentering, papering, furnishing, warming, etc., and the terminus a quo of a lot of future ones, in which it will be concerned when undergoing the destiny of a physical room. The physical and the mental operations form curiously incompatible groups. As a room, the experience has occupied that spot and had that environment for thirty years. As your field of consciousness it may never have existed until now. As a room, attention will go on to discover endless new details in it. As your mental state merely, few new ones will emerge under attention’s eye. AS a room, it will taken an earthquake, or a gang of men, and in any case a certain amount of time, to destroy it. As your subjective state, the closing of your eyes, or any instantaneous play of your fancy will suffice. IN the real world, fire will consume it. IN your mind, you can let fire play over it without effect. As an outer object, you must pay so much a month to inhabit it. As an inner content, you may occupy it for any length of time rent-free. If, in short, you follow it in the mental direction, taking it along with events of personal biography solely, all sorts of things are true of it which are false, and false of it which are true if you treat it as a real thing experienced, follow it in the physical direction, and relate it to associates in the outer world. James' notion of "pure experience" provides a philosophical basis for the experience recorder and reproducer (ERR) that is the core of the informational theory of mind and a solution to the "hard" problem of consciousness. If anyone urge that I assign no reason why the successive passing thoughts should inherit each other's possessions, or why they and the brain-states should be functions (in the mathematical sense) of each other, I reply that the reason, if there be any, must lie where all real reasons lie, in the total sense or meaning of the world. If there be such a meaning, or any approach to it (as we are bound to trust there is), it alone can make clear to us why such finite human streams of thought are called into existence in such functional dependence upon brains. This is as much as to say that the special natural science of psychology must stop with the mere functional formula. If the passing thought be the directly verifiable existent which no school has hitherto doubted it to be, then that thought is itself the thinker, and psychology need not look beyond. The only pathway that I can discover for bringing in a more transcendental thinker would be to deny that we have any direct knowledge of the thought as such. The latter's existence would then be reduced to a postulate, an assertion that there must be a knower correlative to all this known; and the problem who that knower is would have become a metaphysical problem. "With the question once stated in these terms, the spiritualist and transcendentalist solutions must be considered as prima facie on a par with our own psychological one, and discussed impartially. But that carries us beyond the psychological or naturalistic point of view. ("The Consciousness of Self," in Principles of Psychology, vol.1, pp.400-401.